Nicolas Kelly and Katie Greiner walk in last year’s Big Chill. This Friday, Grand Central Bowl marries more than a few of Portland’s favorite things at Big Chill, a lifestyle event presented by Widmer Brothers Brewing with fashion show produced by Jillian Rabe, LLC. Both the launch of Widmer’s Brrr Seasonal Ale and the runway show of cool-weather gear compete to steal the show, but add the mixed media art, photo booth, music and silent auction benefitting the Snowdays Foundation and we have a high-energy, many-moving-parts event. I mentioned this all takes place in a bowling alley, right? As Jillian puts it, there is no shortage of stuff to do. 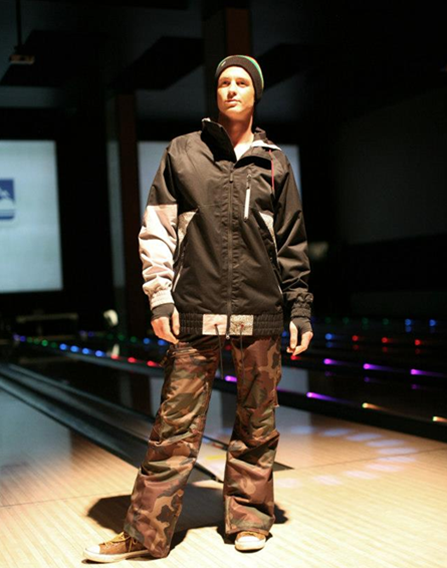 The bowling lanes become the runway for the show, featuring a fresh mix of local brands and retailers, heavily leaning toward skate, street and snow style. Model Alex Green on the Big Chill 2012 runway. “Style is a more appropriate word to use than fashion for this event, which I really like,” Jillian says. She purposefully books a range of models: some are working models and others are people who are active in their community. This show is one of her favorites to produce because of the opportunity to showcase and celebrate a wider variety of models. Retailers include Mojave, West Burnside’s new boutique on the block, which manages a perfect mix of rustic PDX and new-school-cool LA. Bringing the street and snow to the event are Unheard, a Portland-based skateboard company that focuses on skate decks and graphic tees, and Seattle-based ski and snowboard shop Evo. Local headwear company Capture will be joining the runway for the first time, and funky Portland-based lounge-wear brand Funsie returns as a crowd favorite (because really, what’s better than a onsie?). Not by accident, Big Chill is a celebration of what makes Portland special: A fun, inclusive community vibe with great art, fashion, beer and music. Plus, it helps those of us dreading months of clouds and rain remember what’s fun about the Northwest in the winter. I asked Jillian what she likes about Portland once the days get shorter and darker. Jillian Rabe: Whatever your version of brightness or happiness, integrate it into your winter life. She adds that for her, colder days mean styling herself a little more creatively and using more color. Beyond mastering the art of getting out the door feeling great in what you are wearing, she adds that getting a leg up on your goals can be empowering—whether it’s style or music or working out or spending time with friends. Come celebrate the impending chill Friday November 22 at Grand Central Bowl, 9:00pm. Free! Visit Jillian’s Instagram for more: @JillianRabe and her website here. Read more "Winter Is Coming…Complete With Art, Fashion & Beer"
Read more "Great Grand To Be"